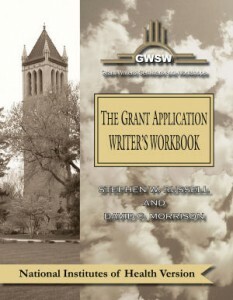 The changes in this Workbook edition pertain to the preparation of a standard NSF grant proposal. We’ve offered guidance on how to address NSF’s new requirement that the Project Description contain a separate section labeled Intellectual Merit and also revised information regarding NSF’s use of preliminary proposals. Additionally, all screen shots and URLs have been updated to reflect current information. We’ve also provided some important cautions and caveats. For example, GWSW has long advocated that all applicants seek pre-submission input from a relevant Program Officer regarding a project’s programmatic relevance. However, in this Workbook version, we provide clarification that Program Officers in some NSF Divisions and Directorates do not welcome pre-submission contact with applicants. Another clarification we’ve included in this edition is that, if a proposal includes vertebrate animal studies, key information necessary for reviewers to evaluate the proposed vertebrate animal studies must be included in the Project Description. Descriptions of prior NSF funding and budgetary aspects for the proposed project also involve modifications. New information is provided regarding the timeframe during which any PI and Co-PI who has received prior NSF funding must report on that support within the Project Description. Also, the part of our Workbook pertaining to budget justification has been revised to address several NSF updates, such as the fact that the number of allowable pages for both applicants and subawardees has increased to five and that indirect cost amounts are to be specified within the budget justification. Additionally, NSF has established a new template that is required for all proposals, and adjustments have been made to our writing timetable template. First, how NSF requests that applicants provide collaborators and other affiliations (COA) information has been significantly revised. COA information is no longer part of the biographical sketch and must be provided using a downloadable standard NSF COA template. Second, we have updated and partially reordered the list of tasks within the writing timetable template that we provide for you to enhance their logical flow and thereby prevent internal inconsistencies across different sections of the application. Because this Workbook serves as a complement to, not a replacement for, the PAPPG, we predict that you’ll find the January 2018 edition of our Workbook an invaluable tool in writing your next NSF grant proposal. If you’ve never owned a copy, or if your copy is more than two years old, visit our NSF Workbook page to order now.